Every room in your home has the potential to save you money in so many ways that are overlooked by most people. Whether money is leaking out around doors and windows, being wasted on lighting, or being sucked up by humidity, almost every home has areas where a little investment now can save a lot of money down the road later on. The basement is no exception and is actually a room where a lot of lost money can be found. Basements face a few challenges that the rest of the house don’t usually encounter. Many of us keep an assortment of appliances in the basement, and it is also where the electricity, water, and hot water that service the entire house are often centered. Some people use basements as dens or recreation rooms while others use the basement for storage. Since the basement is underground, it can also take stress from ground settlement or root or water damage from the soil around it. Some of saving money in the basement can be as simple as routine maintenance to take care of these issues. 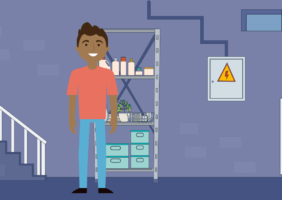 Saving money in the basement can also save a much more valuable resource – the health and safety of everyone who uses the room. Especially since many of the utilities around the house begin here, it is important to ensure the basement runs efficiently. Basements also collect mold and dampness, especially if plumbing runs through them, which can contribute to weakened immunity for everyone breathing the air. An energy survey can not only help save money on energy but can also find some of these other issues. Many common problems in any room also often cause energy inefficiency in the form of wasted lighting, temperature control leaks, and intrusion of humidity. The basement holds a lot of possibilities for these types of issues, but an energy survey could mitigate or eliminate them. The following video contains information on how you can save money and energy in your basement. Check it out and start saving right away!